Since apples are abundant in the fall, they are usually a great price. Knowing how to preserve apples for winter use is a great idea to save money and have apples all the time! Fall brings lots of apples in our area. We have an apple festival that lasts an entire weekend, where you go around town, collecting different apples from local businesses. There are caramel apples, apple cider, and even bobbing for apples if you are so inclined. It’s one of the most fun ways to bring in the cooler weather, and enjoy the fruits of the season. I love apples, and having them on hand all year long is a MUST in my family. We eat them by the jarful when made into applesauce, or by the bagful with dehydrated fruit leather and apple slices. Apple cider vinegar is always on hand, too. Because my family loves apples so much, and they don’t grow year round here, I must preserve apples when I can. Preserve apples by making applesauce. This is one of the best ways of how to can apples without sugar. First, wash the apples and cut into quarters. Slide your knife at an angle to remove the core, leaving the apple skin on. You can peel them, if you want, but you really don’t have to. Save the cores, and if you peel them, save the peels. Then, place your apples in a large pot, without crowding, and cover with water. Bring to a boil slowly, as the apples cook down. When they are soft and mushy, remove the pot from the heat and transfer the apples to a blender or food processor and blend until they are smooth, or as chunky as you like. You can add 1 Tablespoon of cinnamon per quart at this time, if desired. Return the applesauce to a rolling boil, and fill hot jars to ½ inch headspace. Carefully remove any and all air bubbles. This is especially important for applesauce, as there can be a lot of them. Water bath process for 20 minutes for pints, 30 minutes for quarts. pressure canning apples made into applesauce isn’t a good idea, as it gets too “frothy” in the canner and can go all over the place. ACV is a great item to have on hand for salad dressings, recipes, health and beauty and even cleaning. It’s so easy to make, too! Simply place the peels and cores of the apples that you have leftover from canning, applesauce, or pie making into a gallon sized jar.Stir the sugar into 3 cups of the water and pour over the apples.Fill jar with water to about 2 inches from the top of the jar.Cover with several layers of cheesecloth to help keep out bugs, but allow fermenting gasses to escape. After 6 weeks, drain off the liquid. This will be hard cider at this point. Compost the apple peels/cores.Store in a tightly capped jar for another 2-4 weeks to finish the fermenting process. You now have vinegar! Store in a tightly capped jar, and use as needed. Preserve apples by making fruit leather. If you love applesauce, but are running out of room to keep the myriad of quart jars on hand, why not try dehydrating it? Dehydrating it is a great way to preserve apples in a compact space. Simply spread prepared applesauce on a dehydrator sheet and allow to dry for 24 hours on low. If you don’t have an oven, you can also spread the applesauce to dry on a cookie sheet in a low (200) oven for 24 hours. Cut into strips and wrap in plastic wrap to keep. Great for camping, hiking, kids lunches and quick snacks! Preserve apple slices by drying in the dehydrator. 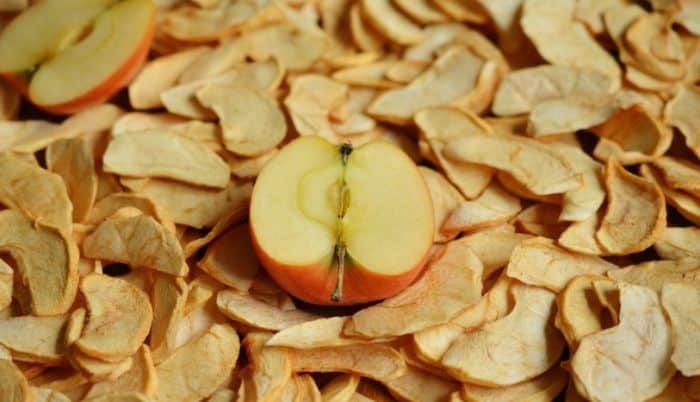 You can also dehydrate apples by making dried apple slices using a dehydrator. Simply peel the apples, cut into slices and dip into lemon juice to help prevent browning. Lay in a single layer on dehydrator sheets and allow to dry for 6-10 hours on medium heat. Store in an air tight bag or jar. These are just SOME of the best ways to preserve apples. What else can you think of to preserve them? Be sure to pin this for later! Making hard cider is my favorite way to preserve apples for later! Planting long keeper varieties to store in the basement on racks for fresh apples is also a good idea if you have the space available. 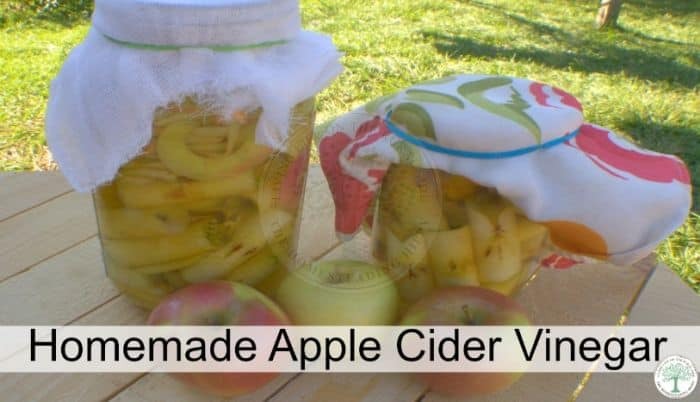 Thanks for the apple cider vinegar recipe I will have to try making that this year!